Latex Gloves - Keep Germs at Bay! Use Latex Gloves ~ Keep Germs at Bay! 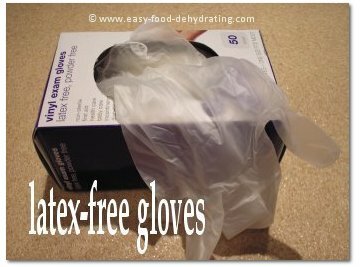 Use latex gloves when handling your dehydrated foods. There's absolutely no point in ruining your dehydrated fruits and veggies with 'dirty' hands! It's easy to keep your germs all to yourself by simply slipping on a pair of gloves ... and you're good to go! And there's no need to throw them away after just one use, see my comment at the bottom of the page! It takes no time at all to slip on a pair of gloves ... no, not those boxing gloves ... but a pair of this type of gloves – check out the photo! You can get a pack of 10 disposable latex-free gloves from Target stores. If you want larger quantities, check out Amazon.com for good deals, more about that coming up. I use the vinyl variety all the time, but not because I'm allergic to latex, but because there's no white powdery-stuff left on your hands ... nice feature! The gloves shown are actually vinyl and do not have powder in them and I highly recommend them. I order mine from good old Amazon – from various Amazon vendors, so do your due diligence. Prices for the same item vary from order-to-order. They come in packs of 100. Should last a long time! Use Latex Gloves to Smooth Out Frozen Peas with Ease! 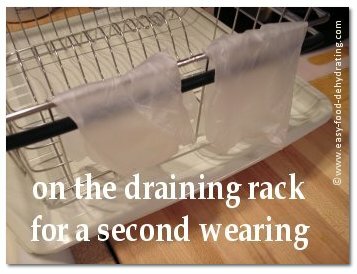 What I have noticed while wearing them is it makes it much easier to smooth out frozen peas or corn on your dehydrator tray's mesh sheets. The warmth of your hands don't melt the peas or corn as fast because you're wearing them and it provides a barrier which slows down the heat transference! Heck, that sounds too scientific, but you know what I mean ... And this means no more peas and corn stuck to your bare hands! It's very easy to break up clumps too when you wear them. Hang 'em Out To Dry! There's no need to throw a pair away when I'm done using them. Either wash them while I'm still wearing them, and then let them air dry on the dish drainer. Consider saving them the second-time-around for household chores or for washing the car! as the old saying goes!